Now you can get the taste of Vermont along with your new Maple Kings ball cap! This New Era relaxed fit adjustable cap proudly displays the Maple Kings new tribute logo that has been created to pay homage to the Vermont maple sugaring industry.. 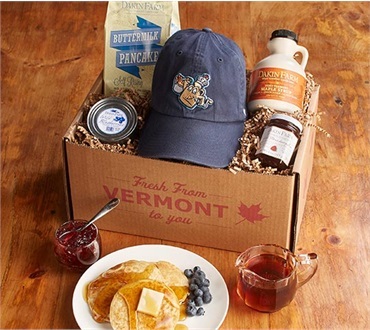 The breakfast box also includes a pint jug of the world's best pure Vermont maple syrup in the most popular grade; Amber color with Rich taste, a generous two pound sack of Buttermilk pancake mix, wild blueberries in a tin to add to the pancakes and a jar of home-style strawberry preserves with big chunks of fruit to round out the kit and add to the breakfast table. Celebrate the Vermont maple sugaring industry in style with this stylish new ball cap and a hearty breakfast featuring pure Vermont maple syrup. Please note: This special offer breakfast kit has a reduced rate on shipping. To save $3.00 on shipping (regular $12.95 at $35.95 now only $9.95), please enter the code MAPLEKINGS in the coupon code box at check out.